Medical marijuana has been legal in states like California for over twenty five years. In the year 1990, California passed the first piece of official weed legislation in the form of the Compassionate Use act. This allowed for individuals who obtained a medical card to grow several cannabis plants for private use. The provision also granted caregivers the right to grow and provide cannabis for medical card holders who require additional assistance. On the contrary, it was only in 2014 when the first two states in America passed recreational legalization: Colorado and Washington. Both of these states enacted adult-use measures allowing individuals over 21 to grow and/or purchase cannabis from dispensaries for recreational enjoyment. As more than half the states in the country have passed medical and/or recreational laws, a new question surrounding the nature of each industry has arisen. What’s the difference between medical and recreational cannabis? When considering the variation of medical VS. recreational marijuana jobs, it’s important to realize that cannabis is more than just for personal enjoyment. While there is nothing wrong with consuming cannabis for it’s recreational purposes, the medical community is especially in need of access to the best cannabis products available. Medical marijuana jobs have changed untold lives of those with ailments ranging from chronic pain to Dravet Syndrome thanks to cannabinoids CBD and THC. Before exploring the distinctions between medical VS. recreational cannabis jobs, it’s helpful to understand the differences between the legislation surrounding each set of laws. Both medical and recreational cannabis laws are voted on at the state level. Because of this, laws differ from state to state and even city to city. From the consumer’s perspective, purchasing medical cannabis is a multi-step process requiring a medical marijuana card. Additionally, medical cannabis prices are often less taxed than recreational products and are therefore cheaper to buy. While purchasing a medical card is expensive at the onset, a regular medical marijuana consumer can make their money back in no time. On the contrary, recreational consumers simply need valid state identification to prove they are above twenty one years of age. While medical consumers can purchase products at age eighteen, recreational users must be the same age as alcohol consumers. In fact, most state recreational cannabis laws are determined by alcohol regulatory agencies. Additionally, recreational customers pay more for their products since they are highly taxed locally and statewide. There is some evidence that the increasingly quick passage of marijuana laws results from state legislators looking to capitalize on legal weed. These individuals seek to reap the rewards of cannabis tourism. In keeping with the variations in consumer laws, dispensaries must uphold the precedent of the specific kind of pot shop they have agreed to operate. One of the recent developments occurring between medical VS. recreational marijuana jobs is the proliferation of more rec shops. While greater access to cannabis products for all people is a step in the right direction, the hard lines between medical and recreational shops are forcing some medical dispensaries to close down. In Portland, Oregon, new laws which limit recreational customers only to rec dispensaries has resulted in a dramatic decrease in some medical dispensaries’ revenue. This is because any adult can be a recreational customer while it is more time and energy consuming to become a valid medical customer. 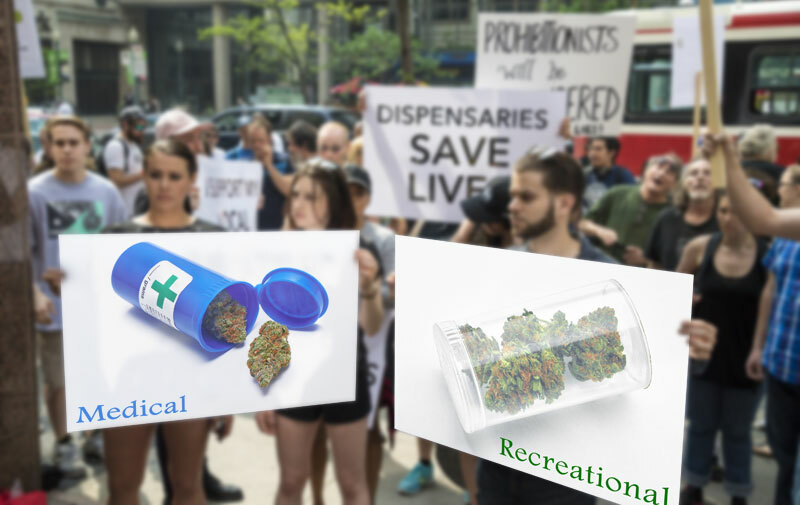 As a result, medical dispensaries are considering shutting down and opening up recreational facilities. The only problem with this is that these shops must then apply for new recreational licenses. This also comes with the threat of less medical cannabis products being available to consumers. Despite the differences, the job positions found in cannabis dispensaries are largely the same between medical and recreational pot shops. The only major variation is that med dispensaries have a greater focus on cannabis as medicine, rather than purely for recreational fun and relaxation. Budtender jobs are known for producing some of the industry’s most recognizable neighborhood employees. These fine individuals assist droves of customers in sniffing their way through the diverse array of products at their disposal. Budtenders get their name from alcohol-slinging bartenders who are both friendly and helpful. In addition to their duties as servers, budtenders also are charged with rolling pre-roll joints, measuring flower and restocking storeroom displays. Dispensary managers are responsible for keeping daily operations running smoothly, ensuring that all employees are following compliance measures. Dispensary managers must also act as the middle person between dispensary owners and subordinate employees. Dispensary owners can be likened to determined ship captains, setting sail on the open ocean of legal weed. Whether these individuals are working medical VS. recreational marijuana jobs, they must persevere through the many confusing regulations of legal operations. Dispensary ownership is not an easy job and is not for the faint of heart. When discussing the medical potential of cannabis products, concentrates must be considered part of the conversation. While these potent cannabis extracts or “dabs” were once feared to be dangerous, they have been proven to retain a greater quality and higher purity than traditional flower. Extracts are made by cannabis extraction technicians who create products that have stronger effects for medical patients. Concentrates contain upwards of 70% pure THC or more, making it a much more intense consumption experience than usual. Whereas you’d be hard pressed to find flower with more than 30% THC, you can expect cannabis concentrates to be extremely potent. This increased potencies allows medical customers to save money in the long run and limit their smoking of flower. Flower contains plant waxes and fats, as well as chlorophyll, which is harsher on the lungs than dabbing. Other cannabis products that are integral for medical patients are edibles. Edibles are made using cannabis extracts and are ideal for patients who want a heavy dose of THC and CBD, without having to inhale smoke. Additionally, edibles are metabolized at a slower rate for most individuals, resulting in more intense, sustained highs. Edibles chefs combine their love of cuisine and cannabis to create final products that taste great and create noticeable physical and mental outcomes. Lobbying is an essential part of introducing and passing legislation allowing for medical and recreational cannabis legalization. Lobbying involves educating politicians on cannabis-related matters that are important to advocates and constituents. Marijuana lobbyists focus special attention on helping to explain the medical efficacy of the plant and asserting it as a right of patients and customers around the country. Lobbyists recognize that policy makers are responsible for having a lot of positions of a variety of subjects, which is why they require extra explanation. Caregiving is one of the oldest legal cannabis jobs in America. This position rose to fame to help provide patients with products they would not normally have access to. Not wholly unlike a pharmacy delivery service, caregivers recognize that some individuals who need cannabis medicine don’t have the time, space or ability to cultivate or visit a dispensary themselves. One sector of the cannabis job market that is tailored to predominantly recreational users is marijuana tourism. Marijuana tourism jobs are more than just being a tour guide. In fact, cities around the country have been hopping aboard the cannabusiness train, tailoring their tourism experience to the weed industry. Bed and breakfasts, hotels, tour companies and spas are all incorporating cannabis into their rental and tour packages to make an extra buck and appeal to passionate cannabis lovers. Especially in Denver, Colorado and Seattle, Washington, early recreational legalization brought in many travelers from around the world looking to experience a fully legal cannabis culture. An area of the industry experiencing an upswing are online marijuana jobs. This covers virtually every career from marijuana web developer jobs to strain review and content writer positions. As mobile apps, websites and niche marijuana publications have risen with the passage of more cannabis-friendly laws, the internet provides some of the best opportunities for scoring decent salaries and having the potential to work remotely or from home. Recently, the marijuana industry was named one of the best for budding entrepreneurs, surpassed only by the healthcare industry. The other reason online marijuana jobs are helpful to the cannabusiness at large is because these positions cater to both medical and recreational customers. With the advent of dispensary location websites and even dating apps, anyone with the ability to code and design has the ability to make a splash in the cannabis industry. Unlike jobs in extraction and edibles baking, web developers and writers can acquire jobs without advanced degrees or traditional academic credentials. If you’re wondering how to apply for marijuana jobs, then you have come to the right place. Depending on if you are pursuing medical VS. recreational marijuana jobs, the application process and qualifications will differ. While medical cannabis dispensaries usually require workers to have a medical marijuana card of their own, recreational shops simply require employees to obtain a marijuana worker’s permit, which is not contingent on the candidate’s medical conditions. Many job applications in the legal cannabis industry are carried out in the same format as other industries. In the case of dispensaries and trimming work, you can easily find open positions available practically all year through unique searches on job sites. What most hiring managers and cannabusiness owners are looking for in employees is trustworthiness, passion and experience. While not every industry worker has sustained previous legal cannabis industry experience, it is helpful for candidates to have a vast knowledge of cannabis law, cultivation and consumption methods. You can spend a lot of time and mental energy wracking your brain on what the future of marijuana jobs is going to look like. While we can’t foresee the future, market trends indicate consistent growth, at least into the 2020’s as more ancillary businesses are expected to join the bandwagon. As such, comprehensive laws allowing for federally recognized cannabis legalization could still occur as the political climate changes in the coming years and decades. Regardless if legalization measures don’t gain much headway in the next four years, state laws should remain mostly intact, allowing for businesses to continue to thrive. In order to keep up-to-date on the changing legislation, visit sites like Norml.org and your state’s “.gov” website to keep an awareness of the most current laws and regulations in your neighborhood and the rest of the country.